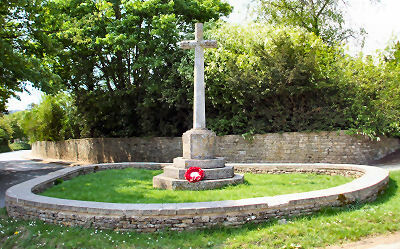 The memorial is sited to the west of the village of Great Barrington, Gloucestershire, UK, on a road junction. Burford is 2 miles to the east. Transcribed by Glen Hicks. Additional Information and photograph supplied by Alf Beard. Information on Frank and John Smith supplied by Gaynor Harris. YE THAT LIVE ON MID ENGLISH PASTURES GREEN REMEMBER US AND THINK WHAT MIGHT HAVE BEEN. SMITH, John (Jack), Private 56251, 23rd (Tyneside Scottish) Bn. Northumberland Fusiliers. Killed in action 14 April 1918, age 22. Son of James and Ellen (nee Fear), of Little Barrington. Commemorated on Arneke British Cemetery, Grave/Memorial Reference: I. C. 1.